Make life more convenient for you and your family with the stunningly designed Amelie L shaped shower bath suite. You’ll receive the Amelie toilet and basin which have been cleverly paired with the contemporary L shaped shower bath. It offers you optimum bathroom flexibility by allowing the option of either a shower or a bath at any time. Ideally this suit is suited to a modern bathroom with its blend of harsh edges, smooth sides and neutral white finish. Materials for use in the bathroom are really important because they need to stand up to the challenge day to day use in a highly moisture-rich environment. Our sanitary ware, in this case the toilet and basin, are made from vitreous china coated porcelain which not only looks great but doesn’t absorb water and is really easy to clean. The bath is engineered from acrylic which is then reinforced with fibreglass and a wooden baseboard for extra rigidity. All of the items are finished in a crisp white to allow compatibility with any style of bathroom. If you’re tight for bathroom space then this is certainly the right toilet for you. It benefits from a shorter than normal projection which means it protrudes less distance from the wall. You might think that the seat is smaller and you’ll have less space to sit down but all of the clever space-saving has taken place at the cistern so you’ll still have ample space to be comfortable. Saving water these days is a really big deal so it’s important that all of our products that use water are efficient in doing so. The Amelie cistern is great because it allows either a large 6 litre flush or a smaller 3 litre flush meaning you don’t have to use a lot of water if you don’t need to. These different flushes are controlled using a discreetly fitted push button which is mounted to the cistern lid. People generally spend an average of 20 minutes a day on the toilet. This adds up to over 2 hours a week so the seat has got to be a pleasant place to perch. With the Amelie toilet you don’t just get a comfortable seat but you get one with a wonderful soft close mechanism too. This ensures a slow, silent and controlled decent to avoid any loud bangs or injuries, which any time of the day can be rather annoying! The seat features a wraparound design and of course a white finish to match the pan and cistern. Form and function were certainly not forgotten when the Amelie wash basin was designed and created. It keeps things minimalistic with a single tap hole for use with a standard sized basin mixer. This is done because basin mixers are just so much better than traditional separate hot and cold taps for achieving a perfect temperature and flow. 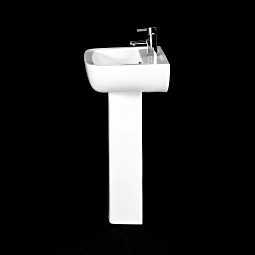 Supporting the weight of the basin and assisting its wall fixings is the full length pedestal. This benefits from a slender design while doubling as a disguise to conceal any unsightly pipework that may be on show. Shower baths are great for a number of reason but the biggest has got to be the ability to just swap between having a shower or a bath any time you like. The overflow and waste holes are pre-drilled but tap holes are not so you can mount them either at the waste end of the bath or along the back wall. A stunning bath screen is included within the package along with a white side panel and the bath has a huge 235 litre capacity so you’ll have more than enough room to lounge those lazy afternoons away too. Really pleased with the suite. We were limited on space so needed a shower bath and this is ideal. Toilet and basin are well made and none of it looks cheap. Great customer service by Plumbworld too - would definitely use again. Extremely good value for money and well packaged fast delivery, what more could you want.....? EXCELLENT...! Good quality product for the price, and looks good.